It is important to know why I am embarking on writing this piece that cites certain milestones in the history of the Scranton Primary Health Care Center. It is now February 2009. Our nation has an exciting new president, but we are facing a severe economic crisis, the near collapse of our financial system coupled with widespread unemployment. This worsening economic environment fractures even further the already broken healthcare system in the United States. More than 50 million Americans are uninsured and as layoffs occur this number increases daily at an alarming rate. So how does my story that began almost thirty-five years ago relate to our current dilemma? It does because four individuals that we encountered in 1975 were as destitute then as Americans who have no health insurance are today. It was a hell on earth for them in 1975 as they tried to cope with illnesses that no one would treat I hope that in some small way our story may engender a ray of hope for people today who are suffering in the same way. I hope, too that those who are trying to fix our broken healthcare system in the twenty-first century will feel a bit braver as they go out to meet this problem that they are trying to solve for the American people. Let's get started! I've been meaning to write this story for at least twenty years, and I've run out of excuses not to. I'm 76 years old, and my time is running out. If I don't get at this task, no one else will, because no one else lived out this saga on a day-to-day- basis as I did. This story tells of the miracles that occurred when we, my friend Frances and I, were trying our best to find a way to provide doctors' visits to the poor. We were two Sisters, members of a religious community and loosely connected to a rather radical ecumenical group, Team Ministry, that did all kinds of good stuff for the destitute. Frances was a nurse and I was a burnt out schoolteacher. It was 1975. The day that changed our lives forever. Frances wanted to visit poor women in their homes who were ill, because she saw them only in a hospital setting. Sister Nancy who worked with Team Ministry gave us a list of four very poor women with medical problems. We set off to visit these women who resided in probably the "worst" public housing project in the City of Scranton that is located in northeastern Pennsylvania. By "worst" I mean the project that had the worst record of violence, domestic and otherwise. First, we visited Florence, a widow, who told us the sad story that when her husband became very ill at home one evening no ambulance would come for him because the project kids used to shoot guns at the tires. A physician house call was unthinkable. Florence's husband died at home that night. She called a cab and the cab driver and she placed her deceased husband in the back seat and drove him to a hospital emergency room so that he could be declared dead. I can still see Florence the day we met her, proudly showing us a framed picture of her son in his dress U.S. Marine uniform. Our second visit was to an elderly woman. I can't remember her name, but I'll never forget her story. I'll call her Isabel. She limped to the door and let us in, though she had never seen us before. She lived alone. She told us that she had a hip replacement and she was paying the surgeon $25 a month for the rest of her life. Her sole income was her social security check of about $125 a month. I told her that she should just not pay the doctor anymore because she couldn't afford to. She insisted that she must continue paying him because she needed surgery on her other hip, and if she didn't pay him he would refuse to replace her other hip. Then she would end up in bed in a nursing home, which was to her a fate worse than death. How could Frances and I refute her logic? We didn't even try. We promised to pray for Isabel! Next we visited Irene, a woman in her middle forties, married to Ed and the mother of four. She had a gynecological problem that caused frequent and severe hemorrhaging. Irene was terrified because she had convinced herself that she had cancer, and she could not even get an appointment with a gynecologist. Her sole source of medical care was emergency room visits where she was told to see a gynecologist as soon as possible. Her problem was that she could not afford to pay for a visit and treatment and no gynecologist would accept Medicaid patients. Irene was panicky and crying as she told us of her plight. Things were going from bad to worse for Frances and me that day, because we had no idea how to help the people we were meeting. Our final visit of the day was to June, a single mother of two. June's mother also lived with her. June was in her late twenties and her daughters were about four and seven years of age. June told us that she had been diagnosed with an advanced case of cancer of the cervix. An emergency room physician told her to obtain surgery as soon as possible, but June was unable to find a surgeon to help her. She was very frightened. She had no money, she had no husband and her mother was ill. Her father had died of a heart attack while driving a public transportation bus. What a day that was. Frances and I couldn't stop thinking about Florence, Isabel, Irene and June, and we didn't know how to help them. I could not sleep nights thinking about them and how I would feel if a member of my family or I were in their shoes. What to do? We considered going around town begging physicians to see these women and we tried a little of this with limited success. Eighteen months that changed nothing. We decided to talk to George, the administrator of the state hospital, where poor people went to the emergency room for primary health care services. This hospital was founded to treat injured miners, but our mines were closed and the once great specialty clinics were discontinued. We were confident that George would give us good advice so that we could help Isabel, Irene and June. George gently let the air out of our balloon, telling us that the Medicaid system was quite inadequate, that physicians received a pittance for their services, that there was a shortage of physicians, and they could not be forced to admit the poor to their practices. In other words, the Medicaid system was not really a system of care. But George did give us a straw to grab at. He told us that we could use a hospital conference room to convene meetings of "experts" of our choosing to try figure out how to make the system work. Met we did for eighteen months just spinning our wheels. Frances and I were fortunate though to find three other kindred souls who were as determined as we were to make the system function as it should. They were John, an esteemed business leader, Bob a young, brilliant Harvard lawyer, and Walter a dedicated sociology professor. About twenty-five people, including some physicians, drifted in and out of our meetings, sometimes trying to help, sometimes asking for help, sometimes just nosy, sometimes throwing roadblocks in our path. The five of us, our nucleus group, (John, Bob, Walter, Frances and I) finally came to realize that there was nothing we could do to make the system work. One day in 1976 just the five of us were meeting and Bob suggested that we terminate the large group meetings, form a private non-profit corporation and find a way to start a primary health care center that would accept everyone. We all agreed. The dye was cast! Three years filled with hope and prayers. What to do next? Frances was finishing her B.S.N. degree and working, Bob was lawyering for a prestigious firm and John was business manager of a hospital. The day-to-day stuff was up to me. Frances' mantra was: "If God wants us to establish a primary health care center, it will happen." I just made to-do list after to-do list and searched out every idea that anyone on our team could think of. At the same time I was working half-time writing grants and newspaper articles for the children's hospital where Frances and I lived. I discovered that the federal government's Bureau of Primary Health Care funded start-up community health care centers, so I buckled down and I wrote a 150 page grant that Frances and I hand delivered to the regional office in Philadelphia about ten minutes before the deadline, fully confident that we would be funded. About a month later a federal grant officer called me telling me that our application was rejected because our city didn't meet the infant mortality rate, didn't have enough poverty, medically underserved areas (MUA's), etc. etc. etc. We decided to try the private foundation route searching for money. Miracle #1. The search started, believe it or not, with cookie crumbs on a rumpled up newspaper page in my bedroom. I was irritated to see this sight and I wondered who put the stuff there. It turned out that Sister Damien's sister in Connecticut had sent her cookies and had packed the cookie box in crumpled newspaper so that the cookies wouldn't break up in the mail. As she was discarding the newspaper she noticed the heading "Primary Health Care Center Funded." Sister Damien knew what Frances and I were trying to do, so she put the newspaper in my room. The next morning I called the Connecticut Hospital where the new primary health care center was. The Robert Wood Johnson Foundation (RWJF) had funded it. The administrator referred me to Amy, the development person who had written most of their grant application. Amy, who said she was a number cruncher, was very informative, and she advised me to visit a few people who might help us, especially, Dr. Michelle, a gynecologist. Dr. Michelle had run a RWJF funded center in the Carolinas, but she was currently residing in Princeton, NJ. not exactly how we imagined a physician's home would look. Once inside, we proceeded to tell her in the most dramatic language we could muster of the plight of Florence, Isabel, Irene and June. She was rather amazed to hear these real life stories coming out of Northeastern Pennsylvania as well as our eighteen-month sterile meeting period. Before we knew it Dr. Michelle's friend, Georgia, arrived so Frances and I prepared to leave. Dr. Michelle asked us to sit back down and tell Georgia our amazing story. Georgia was equally shocked, and then to our delight and wonderment, Georgia said that she was employed at RWJF that was located on Route 1 on the outskirts of Princeton. We asked Georgia to tell us who at RWJF might listen sympathetically to our story. She mentioned a few names that I scribbled down, and then she emphatically said that Terry was our person, that we should call him. With that we thanked Dr. Michelle and Georgia, and Frances and I drove home sharing our impressions of an amazing afternoon. We asked Bob to call Terry, thinking that a lawyer would do a much finer job than either of us. Bob was willing to call Terry, but he thought that I would do a better job because of our eye-witness accounts. Frances and I prayed fervently, then I picked up the phone, called RWJF, asked for Terry and gave him my spiel about how badly our people needed access to primary health care services. He listened for a long time, and then he gave us an appointment to see him at RWJF. In a week or so we drove back to Princeton in our dilapidated jalopy hoping that it would not break down. Terry was very kind and mild and he took notes as we talked. He warned us of the keen, nation-wide competition for RWJF grants. He told us that we had to do a lot of preparation, that we must conduct a reliable need survey, that we must prepare a four-page narrative, and that we must construct a detailed five-year budget of our intended operation. Terry sensed, and he was absolutely correct, that neither one of us knew one thing about accounting, budgeting or money management. He told us that we should contact a fine RWJF consultant who would help us. He gave us her name and phone number in Connecticut. Yes, he was referring us to Amy! Terry was a bit amazed to hear that cookie crumbs were responsible for our initial contact with Amy. Terry was quite charmed by Frances as everyone always was. Both their backgrounds were Slovak. I told Terry that people often referred to us calling Frances "the pretty one" and me "the other one," but we were a team. We couldn't wait to get home and tell the rest of our team, Bob, John and Walter, about Terry and his charge to us. Walter, who has a Ph.D. in sociology, volunteered to conduct the community survey with the help of his college students. Bob agreed to chair our newly formed governing board, and John gave continual advice about our budget. Frances and I did our homework searching out the local health care data we needed. I had a few intense budget meetings with Amy and she finally approved of how I filled in the blanks on the model five-year budget she gave us. Now it was time for another trip to Princeton, this time on a freezing, icy day to meet the RWJF application deadline. Many people told us that we were crazy to set out on such a terrible day in our old beat-up jalopy, but we went anyway. We walked into Terry's office with Walter's survey summary, our four-page narrative and our five-year budget. We held our breath as Terry reviewed the precious material, and we were so happy to hear his approval and intention to submit the works to the RWJF governing board. The sun came out on our way home, the temperature climbed and our return trip was great fun. Our hearts were even sunnier than the weather. When we got home we told our team of our success thus far. I called Mary, a simply marvelous friend, confidant and advisor who was extremely well known and respected in the greater corporate and political world. She asked me for the roster of members of the RWJF governing board. She thought for a moment and told me that she knew William, the RWJF board chairman. She said that her husband and she had just returned from a cruise that William was also on. Mary said that she would call both William and Terry to assure them that our cause was authentic. Mary proved to be a strong ally and wise confidant as we set off on our crusade. We were extremely grateful for her unwavering interest through the years. In February 1977 a letter arrived from The Robert Wood Johnson Foundation. With trembling hands and prayerful hearts, Frances and I opened the letter that announced an operating grant of $457,931 to fund our deficit during our first five years of operation. We were jubilant and grateful to God for this magnificent blessing. Miracle #2. While all this RWJF activity was going on, we were also concerned that we had no site for our health care center. Frances and I and sometimes Bob had meetings with Kathryn, the Northeast Pennsylvania Regional Director of Welfare. We kept asking her how to go about accessing care for Isabel, Irene and June. Kathryn understood the problem very well, but she couldn't change the system or force physicians to accept Medicaid patients. Frustration was the tone of our conferences. Then one day Kathryn called me and told me to come to her office alone, and not to bring a lawyer with me. I was puzzled as I walked into Kathryn's office. Herman, her solicitor, and Bill, her assistant, were there. Kathryn came to the point in an extremely brusque manner as she always did. She told Herman and Bill to get us the building at Wyoming Avenue and Ash Street! I had not even asked Kathryn for a site for our primary care center! This meeting lasted only five minutes. I thanked her profusely and I left her office walking on air. Shortly after we were presented with the "keys to our kingdom," a 17,000 square foot school building ca.1900. This beautiful old edifice had served as the Robert Fulton Elementary School #9 until 1935, when a larger school was built two blocks away to accommodate Scranton's growing population due to the expansion of the anthracite mining industry. Our building was converted into the PA Department of Highways until Penn Dot opened a new center in Dunmore. Then our building housed the Lackawanna County Mental Health Mental Retardation Center until 1975 when that program was relocated and renamed the Scranton Counseling Center. We knew that his grand old lady, our new acquisition that towers over the corner of Wyoming Avenue and Ash Street would soon become The Scranton Primary Health Care Center. She can be justly proud of her role of serving the citizens of Scranton in so many ways, and we were very proud to be her new owner. We had to lease the building until a law was passed to authorize transferal of the deed to the Scranton Primary Health Care Center. Bob negotiated the lease, which was a very complicated endeavor, and we became tenants for $1.00 a year and shortly after Governor Thornburg signed a bill into law, conferring ownership to us for the price of $1.00. The deed includes both the building and an adjacent parking lot. The price was right. The location was right, too, because our building is located on Wyoming Avenue, a main thoroughfare of Scranton, in a poor semi-residential, semi-commercial neighborhood only one-half mile from central city. Miracle # 3. Now we had a building, a parking lot and money to operate a primary health care center, but there was yet another hurdle. Where would we get enough money to renovate our building and purchase equipment and furnishings? The heavens opened again. We were granted $80,000 by the Kresge Foundation, $100,000 by the National Campaign for Human Development of the Catholic Church, and $50,000 by the U.S. Public Health Service, Bureau of Primary Health Care. In spite of stern opposition from the "medical establishment" in our community, we received several smaller grants from the Scranton Area Foundation, the Scranton Catholic Diocese, the Northeast Pennsylvania Lutheran Synod, the Wyoming Valley Methodist Conference and the United Way. When we combined all these funds with our $457,931 operational grant from The Robert Wood Johnson Foundation, we were well on our way to establishing a system of care for underprivileged citizens in our community. In hindsight it is phenomenal to think that our little team of do-gooders, John, Bob, Walter, Frances and I had garnered so much support from this wide range of donors before we could provide health care to even one single solitary person. Even more mysterious is the fact that all of our benefactors knew that we had no experience whatsoever and that we would have to fly by the seat of our pants to accomplish our mission. Miracle #4. As we got our feet wet, so to speak, in the renovation process (that would be ongoing for the next thirty years), we began to seek a physician who would also serve as our medical director. This was a formidable task. How would we ever recruit the unique and talented individual we needed? There was a shortage of primary care physicians in northeast Pennsylvania. We had a fledgling operation. The local medical establishment, physicians and hospital administrators opposed us, and rare is the physician who is willing to provide care for the poor on a full-time basis. We placed ads in local and large metropolitan newspapers and appropriate journals, but with very little response. We were seeking a young, dynamic, highly skilled physician who would be dedicated to serving the poor, and courageous and diplomatic enough to face the opposition of the medical establishment in our community. We had only a few months to accomplish this feat. In spite of the odds against us, we were successful in our recruitment effort - a strange story indeed. John had retired from the state hospital, and he was invited to tour a newly renovated section of the hospital on a Wednesday. John liked to walk several miles daily, but it rained on Wednesday, so he went on Thursday instead. As he walked down the hall, his former employees were greeting him and Barbara, the social worker, called out to John that he would certainly want to greet Alfonso who was also visiting that day. John called me to say that he had found our physician. I clearly remember John saying that no matter where we looked or who we interviewed we would never find a finer, more compassionate physician than Alfonso, and furthermore his personality and temperament fit the bill of the medical director we were seeking. I was astounded by John's assessment of Alfonso, because John was a man who carefully guarded every word he said. He never veered one iota from the truth. Upon his arrival in the United States from Valencia, Spain, Alfonso was required to complete a one-year internship prior to beginning a residency program in internal medicine. He served this internship at the state hospital when John was its general manager. When Alfonso completed his three-year residency program in western Pennsylvania, he stopped by the state hospital to renew acquaintances. That was the same Thursday when John was also visiting the hospital. Because of John's powerful recommendation, Bob, Walter, Frances and I were very eager to meet Alfonso. Upon reviewing his credentials, interviewing him, and checking his references, we knew that John was right. We had our physician, our medical director. It was July 1978. Remember, Frances and I traveled to Princeton on the wrong day to meet Dr. Michelle, and we found our way into the Robert Wood Johnson Foundation. Now John turned up at the state hospital on the wrong day and we found our medical director. Miracle #5. 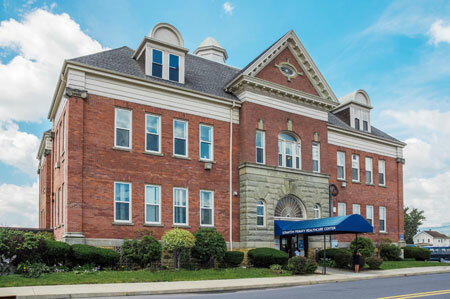 The Scranton Primary Health Care Center opened on December 4, 1978. I was executive director, Alfonso was medical director, Liz was our nurse practitioner, Barb was our medical assistant, Rita was our receptionist, Bill was our accountant, and Sonexay was our maintenance man. Frances was on our governing board and also a volunteer nurse because she was in her senior year completing her nursing degree. In the first few weeks we saw only three or four patients a day, but that changed rapidly as word of our mission spread throughout the community. On December 10th we held a formal dedication of the Center. This line from a poem by Gabriela Mistral, Noble Prize Winning Poet was on the program: Right now is the time his bones are being formed, his blood is being made, and his senses are being developed. To him we cannot answer Tomorrow. His Name is "Today". Bob, who was president of our governing board, was the host introducing our invited guests and thanking our benefactors for the trust they placed in us. He challenged each member of our staff to provide each of our patients with the highest quality of health care and to treat each patient as though he/she were royalty. We have endeavored to do so through the years. Miracle #6. Two months later in February at about 10:30 one morning Rita told me that I had a call from the White House. I wondered who was playing this prank and I went along with it. Kathy on the other end of the line said she was on the First Lady's staff, and she would be arriving in Scranton on a 1:30 flight from Washington to do an advance visit to our Center in preparation for the First Lady's visit. I said yeah, yeah, yeah, asking who this really was. Kathy said that she was not kidding, and she tried to convince me that this was the real thing. Our staff gathered in my room, giggling and enjoying the prank, but it began to become evident to me that Kathy was not giving up, and that this was indeed the real thing. Then I told her that I could not meet her plane at 1:30 because I had a podiatrist appointment, and she said that she would get limousine service. I realized now that this was no hoax so I said that I would cancel my appointment and meet her at the airport. We were all in total disbelief, and rightfully so. Frances and I went to the airport in the old jalopy that was so bad by this time that when we drove over a big puddle, water splashed up on our feet. Fortunately for Kathy this was a sunny day. On the way back to the Center Kathy asked us how we got involved in healthcare so we told her about Florence, Isabel, Irene and June. We popped in on June, had lunch at Cooper's Restaurant and then Kathy toured our Center, met our staff and made some notes for herself. On our way back to the airport Frances and I asked Kathy why the First Lady wanted to visit our Center. Kathy answered that she had called the Robert Wood Johnson Foundation and asked for the name of a healthcare facility that was run by people who took responsibility in their community to solve problems and help people. Kathy had talked with Terry at RWJF who advised her that our Center fit the bill, so Kathy called us to arrange the advance visit. Frances and I had never toured the White House and in our wildest dreams we would never have imagined that the White House would ever come to visit us. But it did. On Holy Thursday 1979 First Lady Rosalynn Carter visited our Center, met our staff and members of our governing board. She commended us all for the endeavor that we had set off to accomplish, and for our effort to provide healthcare services to our fellow citizens who were without the means to access care on their own. Words cannot express the excitement we all felt that day, surely one of the most memorable in my lifetime. Yet there's always a funny wrinkle in anything human beings set out to do with absolute perfection. Here's one. Days in advance the U.S. Secret Service went through its paces in an incredible detailed manner assuring the safety of the First Lady. The local F.B.I. agents were assigned tasks, too. I have never seen such attention to detail: checking our building from top to bottom, credentialing our staff and governing board and even demanding that no employee in the book manufacturing plant across the street stand in any window during the First Lady's visit. Remember where Lee Harvey Oswald was on that terrible day in 1963! Believe it or not, a family of three, Mom, Dad and their little girl, demanded entry into our Center about a half-hour prior to the First Lady's arrival. They had an appointment with one of our physicians. The security people had sealed off the building, but somehow they let the family in. The First Lady cordially greeted the little family. Only a few of us staff members knew that the father had been in jail a number of times for robberies, and that he was mentally unstable. We never told until this day! Life was moving along a steady pace. We had ups and downs as our Center went through its growing pains, but we did not have an elevator that went up and down. Instead we had a lift that serviced only our first floor. It barely met the handicap code, and it often broke down. Then one day Bruce, the Bureau of Primary Care regional administrator from Philadelphia, paid us an unannounced visit because he was in town for another reason. He stopped by to say hello and to ask directions to Steamtown U.S.A., a National Park here in Scranton. Bruce loved trains, especially steam locomotives. When he arrived I immediately gave him a tour of our Center. Bruce saw the archaic lift and commented how inadequate it was because it would not allow expansion to our second floor that was vacant. He said that we would get funding for an elevator, and we did, to the tune of $250,000. Our elevator has four stops, it works like a charm, and it guarantees total access to our Center by the handicapped. Now we could seriously begin planning for a dental clinic on our second floor. Miracle #8. One day in March of 2000 Tara called me from her drug and alcohol agency to say that several agencies in town participated in a Housing Urban Development grant program for the homeless called Continuum of Care. Tara said that the agencies were involved in preparing their annual grant application and that it might be possible for our Center to get a piece of the action because homeless people sought our care. This was a very long shot because HUD is interested in housing, as its name implies, not in healthcare. Regardless, we prepared a HUD application and hoped for the best. We asked for funding to renovate a third of our second floor in preparation for a dental clinic. With the remainder of our grant we intended to provide physician visits and dental care to the homeless and hire an outreach worker. On a snowy Christmas morning in 2000 at about 10:00 A.M. my phone rang and it was Tom from the United Way. He asked me if I had checked the HUD website. I didn't even have a computer in my home. He said that the Scranton Primary Health Care Center had been awarded a one million dollar HUD grant to participate in the Continuum of Care Program for the Homeless! Miracle # 9. We were forewarned that we would never be able to recruit a dentist because of the shortage of dentists, most especially for clinics that serve the poor. Dentists were as scarce as hen's teeth, no pun intended. As our renovation was taking place, I was in my office preparing to write our dental recruitment ad. Our receptionist came into my office to tell me that Bill was in the reception room and would like to talk to me. Bill was a dentist looking for a position in Scranton! His wife had just accepted a call to be the minister of a Presbyterian Church here, and he had given up his dental practice of twenty-five years in West Virginia to be with her. We had to undertake a major renovation project to prepare a third of our vacant floor for our dental clinic. The estimates came in at $500,000, and we were entitled to use only $300,000 of our HUD grant for renovation. Two local foundations, the Scranton Area Foundation and the Briggs Foundation each granted us $100,000. The PA Department of Health granted us $50,000 for the purchase of state-of-the-art equipment and furnishings. We hired our first outreach worker, Debbie, who did a fine job locating the homeless and scheduling them for appointments at our Center for medical and dental services. She visited St, Francis of Assisi Kitchen and the shelters on a regular basis. Debbie even met with homeless individuals under the bridges where so many of them reside. In February 2002 we cut the ribbon of our dental clinic with Bill as Dental Director. HUD and the Bureau of Primary Health Care (BPHC) underwrote our operating costs for providing dentistry to the poor. In 2003, because of the demand and our four-month waiting list for new dental patients, BPHC approved funding for a second dentist. At this writing in 2009 we are requesting funding for a third dentist because the need is still so great. Miracle #10. When I consider how fortunate our Center has been, two individuals come to mind. Without them it is difficult to imagine how things would have worked out. Ed, our president and devoted board member joined our operation in 1982, and he has served as president for twenty-four consecutive years. He is a leader in industry and is recognized nationally as an expert in corporate management and personnel issues. He guided our Center into a new role, that of a "learning organization," in which every staff person becomes involved in planning and carrying out the objectives of our Center. In recognition of his ongoing leadership our dental clinic is named for Ed. We already met Alfonso. Our colleagues in the community health center (CHC) world are amazed that Alfonso served as medical director of our facility for twenty-seven years until he encountered a serious health problem. Now, feeling much better, Alfonso continues to serve as a full-time medical staff member. BPHC has always been concerned about the turnover of physicians in community health centers, and has conducted countless seminars on the recruitment and retention of physicians. This might sound arrogant, but we could "write the book" on this topic. Epilogue. I have presented quite a cast of characters to my readers. If you are curious about them, read on. Irene obtained gynecological care at our Center. Fortunately she did not have cancer and she is doing quite well today. June did have cancer, and before our Center opened, with the assistance of influential community members, Frances and I succeeded in twisting the arm of a surgeon, that is figuratively twisting his arm, so that he reluctantly, but efficiently removed her cancer cells. June is fine today. I lost track of Isabel, so I cannot report on her status. Frances and I visited Florence several times after her husband's death and she seemed to be doing quite well. John, one of our founders and a charter board member, died in 1984 at the age of seventy-five. Frances, a founder and our nursing supervisor for twelve years was diagnosed with cancer in 1989. Following her second surgery she was in constant, severe pain and was hospitalized for six months until her untimely death in 1990 at age 45. Debbie, our outreach worker for ten years, also had cancer and suffered for almost two years before her untimely death in 2008 at age 51. Bob, a charter member, past president and treasurer, moved out of town in the 1980's. Subsequently, he was instrumental in developing two hospital systems, one in Ohio and a second in Texas. Walter, also a charter member, past president and treasurer, continues as a sociology professor at a local university and remains a loyal member of our Center's governing board. In June 2002 when I was 69 years old, I decided to throw in the towel and retire after twenty-seven years in developing and administering the Scranton Primary Health Care Center. I wanted to go out on a high note and dentistry was it. The dental clinic was my last hoorah. It was time to pass the baton to a younger generation. By the way, my name is Martha. I am pleased to serve on the Center's governing board that is still under Ed's competent leadership. Our nursing supervisor, Mary Lou, assumed my position and has proven to be a capable and dedicated administrator. On December 31, 2008, our Center completed its thirtieth year of service to our community. Our medical provider staff now consists of five physicians, a nurse practitioner and a physician assistant, all full-time Center employees. The Center currently employs 50 people, including our provider staff. Since our founding, more than 75,000 persons have received medical care for a total of 743,000 medical visits in both in our Center and in community hospitals. Our dental clinic that opened in February 2002 now has two dentists and a dental hygienist on staff, all full time. As of December 31, 2008, they provided 48,247 dental encounters. We are currently waiting for a decision on our application to BPHC for a third dentist. A final note. Even though it is 2009 and our nation is facing seemingly insurmountable problems including two wars, a severe economic crisis and a broken healthcare system we must not give into despair. As Americans we must have the hope, faith and courage to meet and conquer these challenges. I hope that our story will in some way inspire readers to realize that if together we put our shoulders to the wheel, good things can and will happen in the most unpredictable ways. As a nation we must be determined to have faith and work very hard to solve our healthcare crisis. It can and will happen. Remember, David slew Goliath with only a slingshot! I pray daily that The Almighty will find us worthy and watch over our nation as He has since its founding. As you read our story I am sure that you were questioning whether miracles really occurred or whether each incident was merely a congeries of circumstances. I do not question your right to be skeptical. but in any case "we should never lose our sense of wonder - our perception that even with our scientific ways of explaining reality, there is usually more than meets the eye." Miracle on the Hudson, Current Comment. America, The National Catholic Weekly, 2/2/09, p.4. Thanks for reading. God bless you, every one!